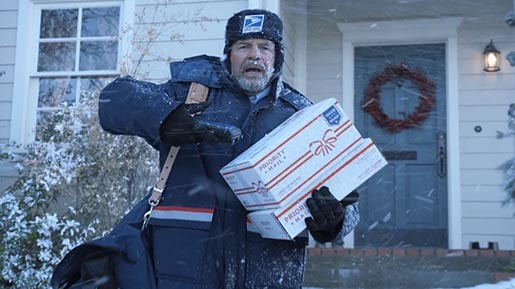 The United States Postal Service (USPS) this year ran a Christmas holiday advertising campaign highlighting the efforts their delivery staff go to during the winter season. Singing their own version of “Twelve Days of Christmas”, employees are filmed delivering in wintry conditions. “Whatever it takes”. The campaign includes two 30 second commercials, a 60 second commercial including outtakes, and a behind the scenes video. (Editorial note – the videos have been removed by USPS). Filming was shot by director Geordie Stephens via Tool of North America with director of photography Stefan Czapsky, 1st assistant director Christian Van Fleet, producer Nadine Brown, production designer Jennifer Davis and art coordinator Jacqueline Anteau. Visual effects were produced at Reel EFX.